Graham Hancock, the author of Supernatural: Meetings with the Ancient Teachers of Mankind could never be accused of pussyfooting around the revelations of his research, and he certainly postulates the heck out of the place of consciousness altering agents in the shamanic origins of religion and consciousness itself. It's a brilliant, breakthrough book which comes close to being the unified field theory of, if not all of the supernatural, at least of all encounters between humans and supernatural beings. 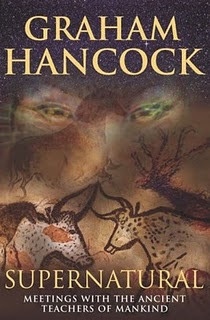 Hancock begins with a description of his own visionary experiences with the hallucinogen Ibogaine, which he took, with a logical vigor that escapes most academics, in order to truly gauge its effect, and therefore the validity of his theories. He follows this with a (perhaps too) meticulous examination of the cave paintings that represent the beginnings of human art, concentrating on their bizarre and seemingly inexplicable nature, at once representative and fantastic, a contradiction that the bonehead academics have (naturally) been totally unable to puzzle out in over a hundred years of trying.